I just wanted to come in and thank everyone for the suggestions. 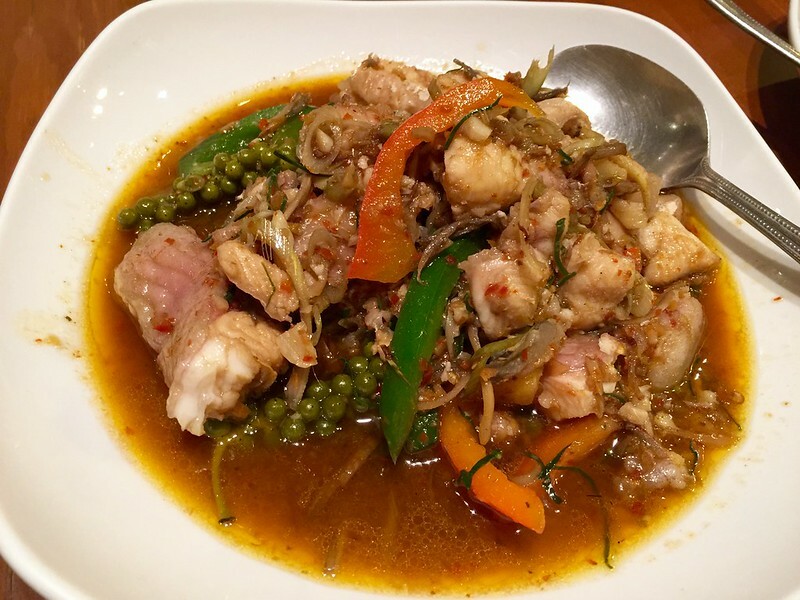 We had been to Aroy a few years ago but were relative Thai Food noobs and walked away unimpressed. In contrast, our recent meal here was fabulous with the grilled pork neck, choo chee, pickled bamboo shoots and the beef tender soup. I think the smokiness and chew of the pork neck separate it from the naam tok I have eaten elsewhere, though my wife slightly prefers the cleaner flavor of the latter. That soup was very aggressively spicy and sour, probably overwhelmingly so and I like really like spicy food and Tom Kha in general. Ladling it over rice helped a bit and it seemed to mellow some as it cooled, but personally I would probably throw a bit more palm sugar in. And holy moley there was a great quantity of top quality beef in there. The sweetness of the choo che was great counterpoint to everything else and a curry I had never even heard about. I was also a huge fan of the pickled bamboo shoots. Just a great meal. I will definitely be back we got two meals out of order for a great price. I do have a few questions though. The suggestions here are very uh lets say meaty. 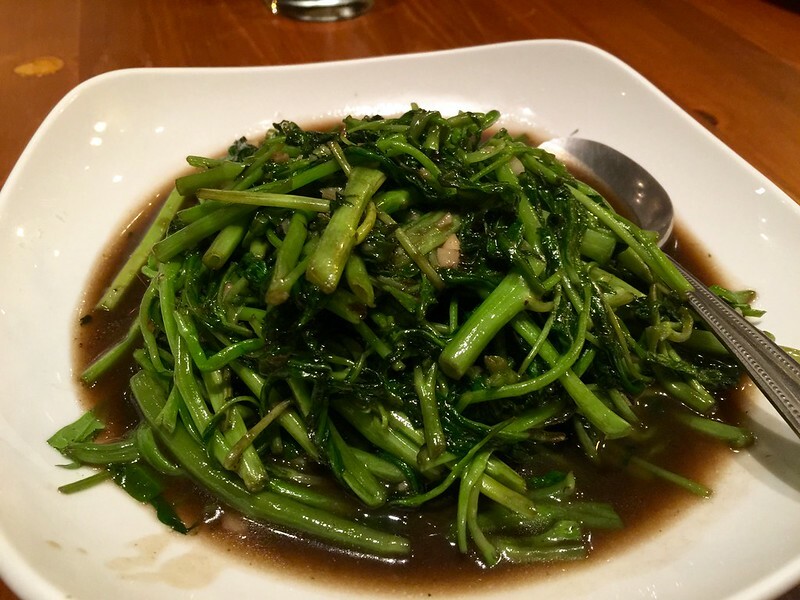 Other than som tam and chinese broccoli with salted fish, any other suggestions for vegetable/fruit dishes? Also how do I go about getting some gaeng hang lay (love this dish) and I really want to try khai luuk kheuy (the fried eggs in tamarind) as I have heard about it before but never tasted it? Thanks again LTHers, you guys rock. botd wrote: In contrast, our recent meal here was fabulous with the grilled pork neck, choo chee, pickled bamboo shoots and the beef tender soup. 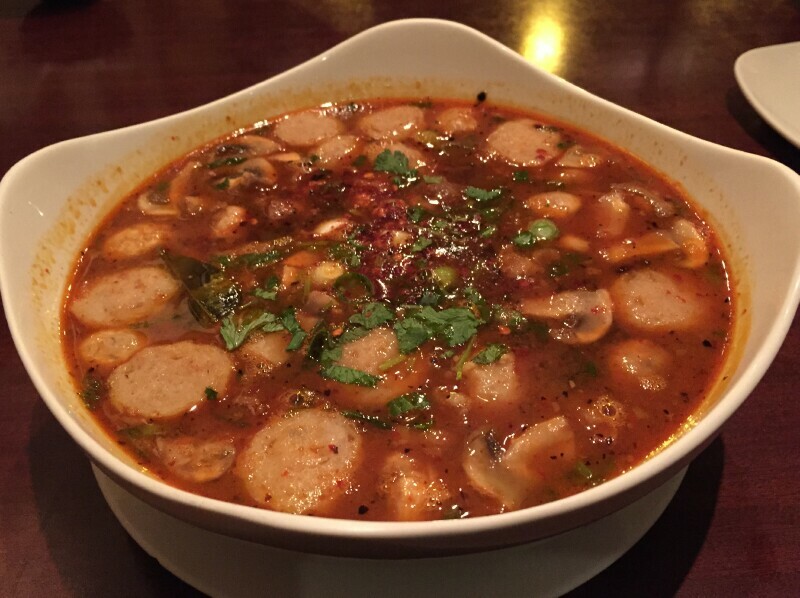 Had Aroy's Tom Yam Beef Ball and Tender soup last night, always one of my favorites. Sour, spicy, rich, made the top of my head sweat and put a smile on my face. Aroy Thai, count me a fan! Public service announcement: Aroy has been closed for about a week, with signs on the windows indicating that they are performing kitchen repairs. So make sure to call before you go. Hoping for the best. I a greatest hits take out order a couple weeks back and everything was as good as ever, especially the northern larb which was probably my favorite. BR wrote: Public service announcement: Aroy has been closed for about a week, with signs on the windows indicating that they are performing kitchen repairs. So make sure to call before you go. Ran into Tee a couple of weeks ago, he mentioned they were going to redo the floor among other repair/upgrades. Should be reopen soon. Sounding from the In-on Thai thread that Aroy is open again . . . go now . . . it's going to get very, very busy after the Check, Please! episode airs 10/23. BR wrote: Sounding from the In-on Thai thread that Aroy is open again . . . go now . . . it's going to get very, very busy after the Check, Please! episode airs 10/23. Yes, they are open. I called them earlier today and they confirmed it. I had that a couple weeks ago (I often get the boat noodles, also highly recommended) and now I want it again. I usually order it at a 4 on the heat scale, which gets me looks from the servers initially. Luckily I only live a few blocks away. The redesigned menu with pictures and categories (New to Thai, Experienced, Something Different, etc) is very helpful. I hope it encourages people to order less familiar dishes, because those are where Aroy shines. Had to make a quick plan b when we found that the restaurant we were hoping to eat @ opens later for lunch on Fridays (House of Wah Sun, 1:30) and ended up @ Aroy. As good as ever but a familiar, yet new dish caught our lucky eyes. Northern Larb Fried Rice is a match made in heaven. Ordered "pet pet" or "Thai hot", for those of us that love both dishes, it was superb. Just finished the leftovers and was compelled to share our good fortune. I've gotten hooked lately on their fried rice dishes--the crab and sour ham versions are terrific as well. Will have to give this one a try. Thx for the tip! Sorry I forgot you Jen. It's right up your phunky alley. You'll love it. Northern larb fried rice?! Since I live a few blocks away, you'd better believe I'll be hopping over there very soon. Sounds as good as anything they have (the ham fried rice is indeed wonderful). Had a perfect lunch at Aroy yesterday thanks to the fried rice tips upthread. Not sure why I have always overlooked fried rice on Thai menus, as I'm addicted to Chinese and Korean versions. Too many spotlight-hogging options on the menu I suppose. That BBQ pork fried rice at In-On caught my attention first. And whereas that aforementioned dish is bold and meaty, the crab fried rice we enjoyed at Aroy was dainty in comparison, though imminently scarfable. A huge ratio of crab, which was sweet as could be and not over-seasoned as to mask its oceanic delicacy. You might be thinking, how could they not have ordered the Northern larb fried rice? It was genuinely a toss up, though my dining partner had a genius idea to order the OG salad version, which was the ideal foil with its brash acidic funk to the rice dish. I'm sure the prefabbed larb rice is the bees knees, by why not have crab in the mix? And I certainly co-mingled these soul mates on my plate, hot damn. 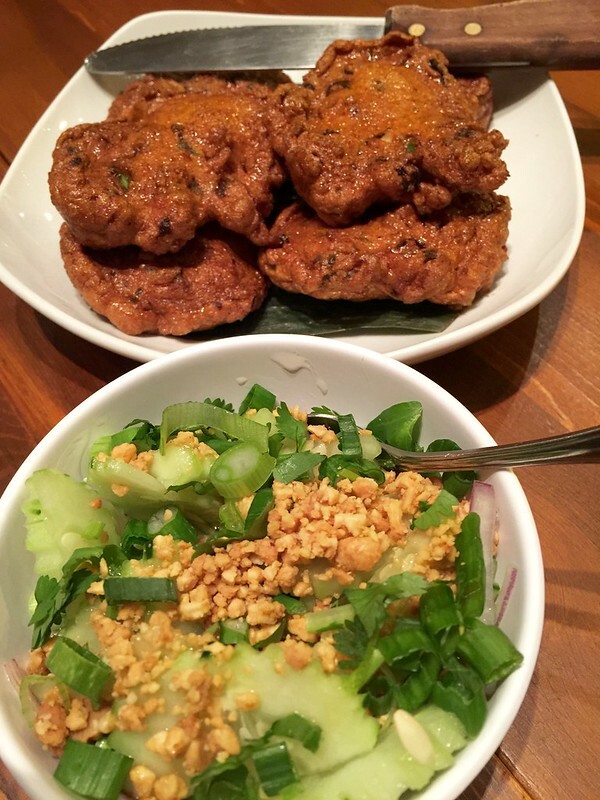 I know there's some new kids on the block and its rad to have an expanding, unrivaled Thai food scene, but after a recent perfect meal at Rainbow, I can honestly say that my stalwarts remain two of my favorite restaurants in the city. Jefe wrote: crab fried rice we enjoyed at Aroy was dainty in comparison, though imminently scarfable. A huge ratio of crab, which was sweet as could be and not over-seasoned as to mask its oceanic delicacy. Aroy crab fried rice on my mind, got there around 10:15, thought they were open until 11pm on the weekends, not so, 10pm close as usual. Chatted with Tee a bit, who mentioned they now close on Tuesdays, and on my way. Got my Thai fix just down the street at Medee Cafe, Thai style congee with a now fully translated congee menu and innumerable options. Very enjoyable meal. Congee, crab omelet, salted duck egg salad, gratis prik nam pla in middle w/lightly sweetened iced chrysanthemum tea far right. Medee Cafe, count me a fan! Jazzfood wrote: Northern Larb Fried Rice is a match made in heaven. I ordered 4 dishes from Aroy on Saturday and was really disappointed that 3 of the 4 clearly had sugar in them: green curry, an eggplant dish and the spicy bamboo chicken. The only thing that wasn't sweet was the shrimp salad. I've ordered from them in the past, and also dined in, not sure what happened this time. Had an excellent lunch here yesterday as well. Sugar was not an issue. Northern larb w/rice, pork neck salad, tod mon (fishcakes, maybe a little sugar in the cuke salad accompaniment) and chu chi pork, which has a bit of coconut milk for sweetness, but not overly so. Aroy consistently delivers delicious food, and I love seeing mama in back still knocking it out. Green curry, like most Thai curries, will have sugar added if you order it in Thailand. In other dishes, you might get a sweetness bump from tamarind paste or coconut, among other ingredients. Indeed, Thai cuisine often counterbalances heat with sweetness (and sweetness with acid), usually by adding palm sugar. Dishes sweetened with refined sugar are common across southeast Asia. 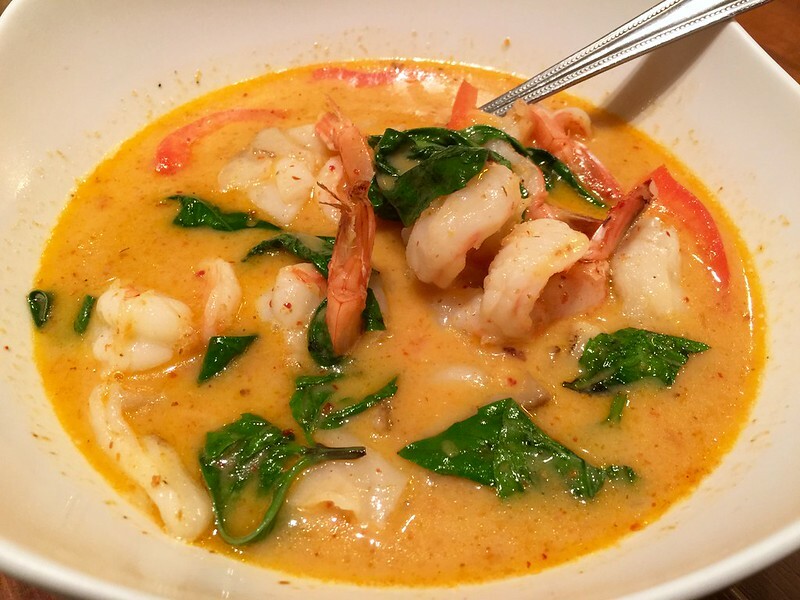 I'm not disputing your taste, because who knows how heavy handed the cook was with the palm sugar the day you were there, but if you want to avoid added sugar in Thai food you'll have to order selectively. Hint: stay away from mee krob! The food definitely did not taste well balanced to me, though I had avoided all sugar for the preceding week, so perhaps my taste buds were more sensitive than to it than they would have been normally. Ho-hum . . . just another perfect meal at Aroy. Grabbed this & Khao Soy at Aroy last night to compare to Rainbow's pad ped pla & Immm's Khao Soy respectively (usual Aroy items being Tod Mun, Basil Duck, Thai Grilled (Moo Ping)). Preferred Khao Soy to the Pra Pad Char. I don't know if it's the same every time, but the lemongrass isn't diced finely and the texture was disrupted by the shards. Decent spicy flavor, but I'd take Rainbow's fish in a H2H. Immm still w/ my preferred Khao Soy, but Aroy's is right up there. Now I want to get the basil duck I bypassed. The only problem I usually have with lemongrass is when someone has not carefully peeled off every tough, exterior layer. So maybe that's what happened. All you have to do is accidentally miss one of those tough layers to slightly screw up a dish. I'm assuming what happened to you was one of those incidents. 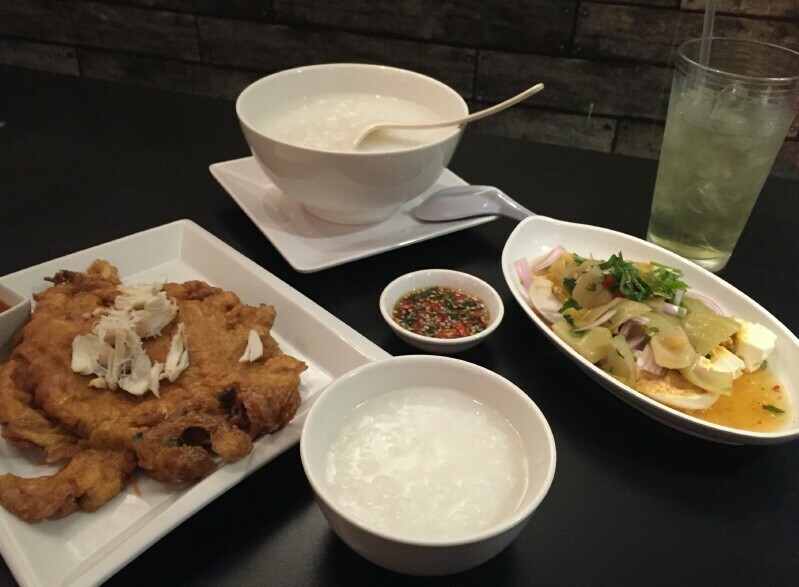 I love how consistently delicious these dishes (and many others) always are at Aroy. This was quite a bit of food for 2 people and we took plenty home. When I get a hankering and go there to satisfy it, the meal always ends up delivering 100%. There are so few places about which I can say this. I think it's one of the main reasons Aroy is such a special and exceptional place. What's the best place to see a copy of their menu? They don't have a website and they don't show their menu on their Facebook page . I know you can find it on other sites like Menupages and Grubhub but those aren't always complete or up to date. Easily, the best place to see the menu is at the table right before you order. nsxtasy wrote: What's the best place to see a copy of their menu? sites like Menupages and Grubhub but those aren't always complete or up to date. I just compared GrubHub to my carry-out menu from Aroy, and it is current w/ items & prices (de minimis differences possibly unnoticed). Thanks for the information (bweiny) and for the wit (stevez).